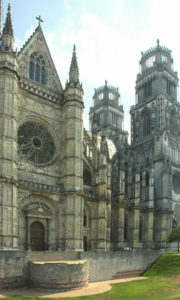 The city of Orléans is located on the Paris & Tours Way, the Camino de Santiago taking pilgrims from Paris to Orléans. If you are lucky enough to walk this Camino route, we have selected 10 Must-See attractions in Orléans. The beautiful city of Orléans has a rich history, as it has been disputed by different monarchs and different religions throughout the centuries. The city has seen many riots and religious wars, therefore, many buildings have been fully or partially destroyed. But all have been renovated and restored to their former glory. Today, it is interesting to see the mark of different periods in the city’s architecture. Since 2000, Orléans is officially a UNESCO World Heritage Site. Located on the Via Turomensis to Santiago de Compostela, the city has a strong connection with pilgrims and the Camino de Santiago. Gothic style, it took two hundred years to build the cathedral. It was then destroyed and rebuilt several times. It was last refurbished and reopened in 1829. Consecrated in 1029, this crypte was built to host Saint Aignan’s relics. This square used to be a marketplace and also where condemned prisoners used to be executed. Opened in the 14th century, this is the main square in the town, with a beautiful statue of Jeanne D’Arc blessing God. The square was under reconstruction for years, and since 2014 it’s a brand new square, very pleasant to walk through or to have a rest in one of its many restaurants. This is the oldest church in town, located in the student district. 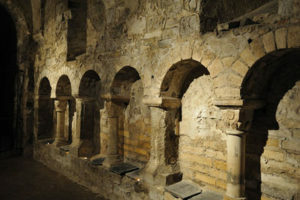 It was very popular in the Middle Ages and was used as salt storage for a while. Desacralised in 1958, and renovated from 1966 to 1976, it nowadays hosts cultural events and exhibitions. After seven years of renovation work, it was opened in 1519. Its name is a reference to seamen’s women who used to come here to thank the Virgin Mary for ‘recovering’ their husbands, and making them return home safe from their sea trips. 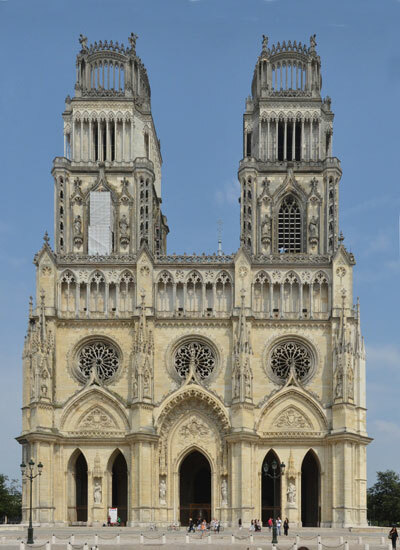 It was built to host the relics of the Holy Bishop who saved the city of Orléans from Attila, King of the Huns. It is dedicated to Joan of Arc. You will find a panoramic animation, interactive touch screen boards, a map and a timeline illustrating the life of Joan of Arc, as well as related material collected over the centuries. Visits in French and English. This is one of the first Protestant churches in France, created right after the Calvinist reformation. Opened on 2nd May 1839, the building is very simple. The rotunda is crowned by a frieze composed of alternating triglyphs and decorated with medallions ray metopes. It was originally surmounted by a zinc dome that collapsed in 1912 and was rebuilt (a bit lower), the same year. In the IV century, Orléans got a rampart and a moat all around the city. Current boulevards follow the outline of this last bastion. The district hosts the St Marceau Cross statue, built in memory of seamen who rescued the city’s inhabitants during the floods of 1846, one of the most important and the most murderous one of the river Loire. Orléans also has several hiking trails, many parks and gardens, and a huge and beautiful forest, la Forêt d’Orléans, extending over 50.000ha! If you are interested in walking the Camino de Santiago from Paris to the beautiful city of Orléans, just take the Paris & Tours Way. If you already are in Orléans and you want to continue towards Santiago de Compostela, you can walk the Paris and Tours Way, all the way to Tours!